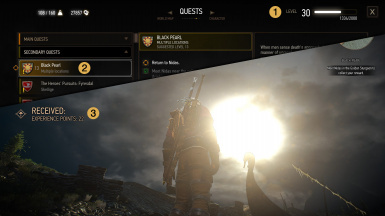 With this mod you can complete the quests in any order you like without losing XP for the quests that are 6 or more levels below the player's level (grey quests). The mod removes the experience modifier that is applied based on the level difference between the quest level and player level. It only removes the quest/player level difference experience modifier, while other experience modifiers, such as the difficulty based modifiers, still apply. There are a few similar mods, but from what I've seen they either do more than just remove the quest/player level difference experience modifier or are outdated. Download the right file for the game version you own. If you own the Steam or the GoG non-GOTY version download the file named "Get full XP from quests no matter the level" or, if you own the GoG GOTY version, download the file named "Get full XP from quests no matter the level (GoG GOTY)". Extract the content of the archive to the 'mods' folder of the Witcher 3 game. If the 'mods' folder does not exist, create it. Based on your play style, if you feel you are leveling too fast due to the extra XP you're receiving when using this mod, you may use one of the variations. Each variation applies an additional experience modifier in order to grant less XP for quests. There are 3 variations of the mod, each one granting 90%, 80% or 70% XP. If the mod doesn't work or you get compilation errors, please make sure you first check all the items on the list below. Make sure you download the correct version of the mod for the game version you own. Make sure you don't end up with an additional folder when extracting the mod to the "mods" folder. You should end up with a folder structure like mods/modXXX and not mods/modXXX/modXXX. If you're using other mods you may have to use Script Merger to resolve the conflicts with the mods altering the same files. If, after checking all of the above, the mod version you downloaded still doesn't work on your game version then please let me know in the comments, as I could only test the Steam non-GOTY version which I own, and I had to retrieve the files for the other versions from different sources. To CD Projekt RED for creating this amazing game. To everyone showing support and appreciation by taking the time to provide feedback, endorse and vote.